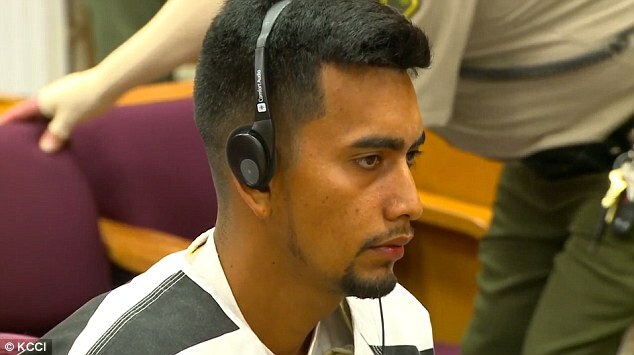 Cristian Rivera, the 24-year-old the suspected illegal immigrant charged with Mollie Tibbetts’ murder, appeared in court for the first on Wednesday for the first time since leading police to her body. The Mexican national said nothing as he entered the Poweshiek County Courthouse on Wednesday at 1pm local time flanked by sheriffs’ deputies. He remained in the same black and white striped jumpsuit he was photographed in on Tuesday and required the services of two translators throughout the hearing. Among those in the public gallery were his parents, the mother of his child and his three-year-old daughter. At the beginning of the hearing, Rivera’s attorney Allan Richards argued to ban the media from the trial and asked that it become private. He also submitted court records claiming Rivera was in the country legally and had been since he was a minor. Rivera is the subject of an ICE detainer and his legal status has been seized on by Republican critics since he was arrested. Police described him on Tuesday as an ‘illegal alien’ despite his employer insisting that they had verified his legal status when employing him four years ago. Rivera’s lawyer cautioned against a desire to portray him as ‘something that he is not’ during Wednesday’s hearing. Despite his efforts, the judge denied his requests and increased Rivera’s bond from $1million to $5million cash. Rivera said nothing other than answering yes and no to his interpreter when prompted. Among those in the public gallery were the suspect’s parents (right), his three-year-old daughter (far left) and Iris Monarrez, the mother of his child. Where is ICE? He did not understand his right to waive his preliminary hearing and conferred with his attorney for a brief moment. His privately retained lawyer said that he came to the US as a ‘minor’ and had been living quietly and respectably for the last several years working for a ‘respectably’ member of the community – the brother of a prominent Iowa GOP member. Rivera was caught after police traced his vehicle which had been filmed on surveillance cameras following Mollie as she jogged in Brooklyn, Iowa, on July 18. He attacked her when she refused to talk to him and threatened to call the police. Prosecutors argued for his bond to be increased for the safety of the community. ‘We think it is appropriate given the severity of the charge, what his immigration status as it’s been described and the fact that what he is accused of is obviously a very heinous crime the safety of the community should be at the forefront of the court’s mind,’ Assistant Attorney General Scott Brown said. Judge Johnson agreed with the prosecution at every turn. She allowed the media to remain in the room and refused Rivera’s attorney’s request to make the hearing private. In asking that bail be set at a ‘reasonable’ amount, Rivera’s attorney said: ‘Cristhian is a young man. ‘He’s been working for a number of years for a respectable person in this community, he has no prior history, he sits here presumed evidence and so far no evidence has been submitted. The next time he will return to court is on August 31 at 2pm. Richards also said Rivera had been treated unfairly since he was arrested and claimed the characterization of him by police in Iowa and by ICE that he is an ‘illegal alien’ is inaccurate and politically motivated. ‘In this case, the coverage that’s out there is leaning all one way and the fact the government has weighed in at the highest levels… there’s a predisposition that this young man, Cristhian, is guilty. ‘In our system he is entitled to a presumption of innocence,’ he said. ‘It’s a political payback for what’s swirling around and the media is feeding in to it,’ he went on. At the end of the 40-minute session, Rivera’s mother cried as he was ushered out of the courtroom in shackles. The man’s 25-year-old ex-girlfriend was also wrought with anxiety. She held their daughter on her lap throughout. Next to her was Rivera’s father who maintained a stony expression throughout. No one from Mollie’s family was present. 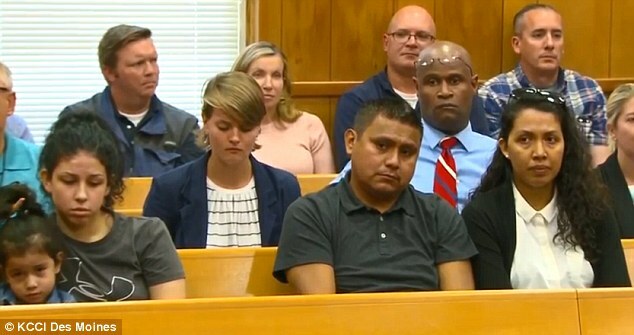 Minutes before Rivera entered the court, they broke their silence with a statement which read: ‘On behalf of Mollie’s entire family, we thank all of those from around the world who have sent their thoughts and prayers for our girl. ‘We know that many of you will join us as we continue to carry Mollie in our hearts forever. ‘At this time, our family asks that we be allowed the time to process our devastating loss and share our grief in private.